Reichenbach Iris Dense Blue (RL3206) is a lovely colour, and much more fun to use than you could guess just by looking at an unmelted rod of it. 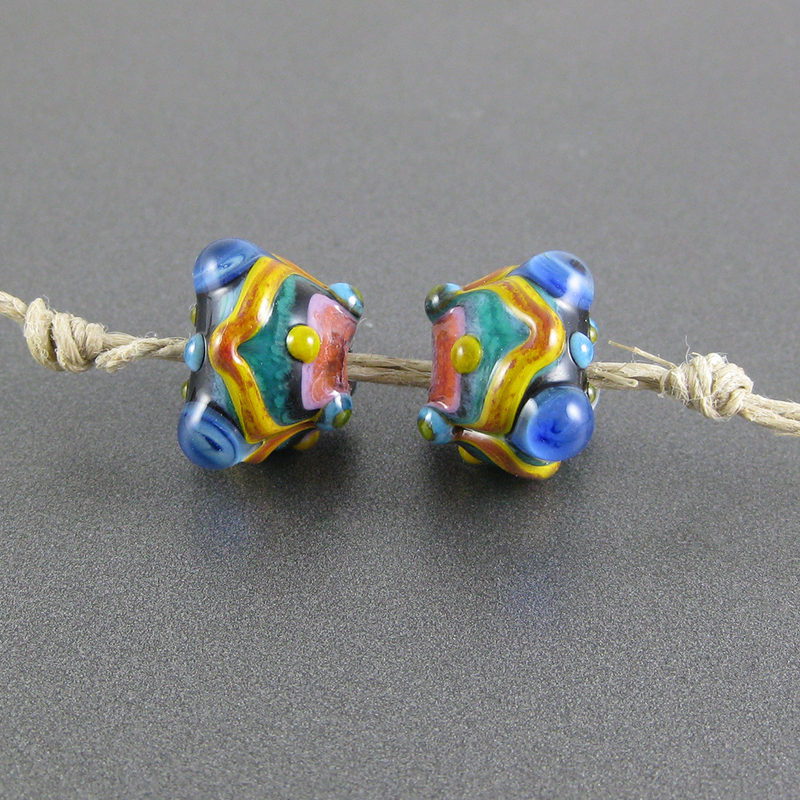 It's soft as butter, very reactive with other colours, and lovely reduced. Let's look at some details. 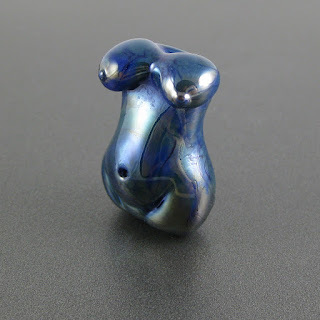 Iris Dense Blue in solid-coloured beads is a mottled blue with a greenish cast, with dark veiny streaks running through it. I expected it to be brighter and sort of lividly blue, and this was a very pleasant surprise. When this colour is reduced, it develops a metallic sheen on it. 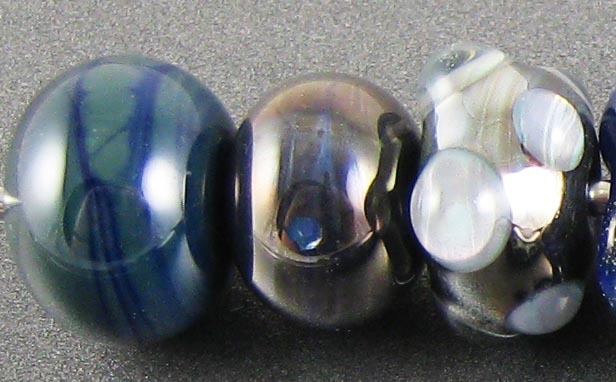 You can see this sheen on both the middle and right-most beads, although for some reason it looks redder in the middle bead. I think that the amount of reduction alters the colour of it somewhat. 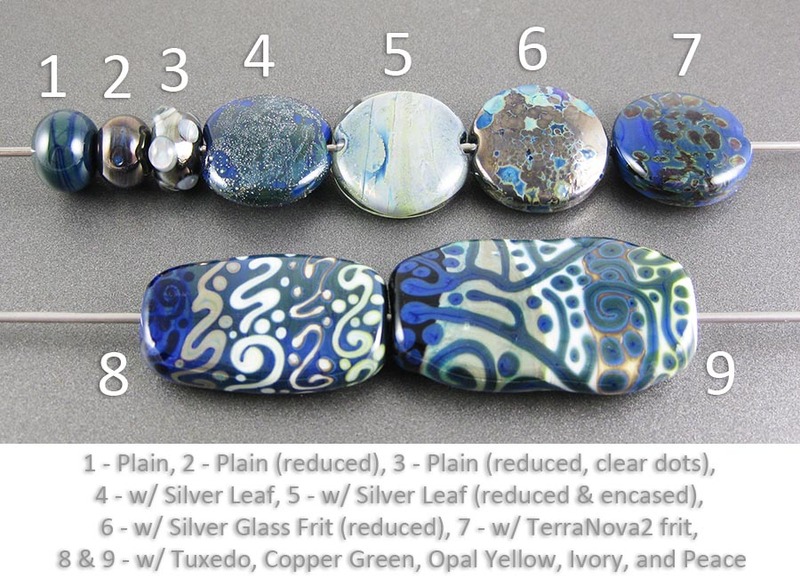 As I found in the rightmost bead, you can encase the reduction on Iris Dense Blue and achieve a mother-of-pearl effect. It does burn off easily, though, so you have to work cool if you want it to stick around. 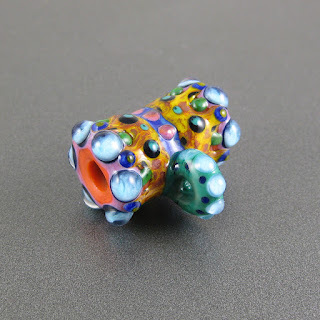 I managed to keep rather more of the reduction in this bead than I did in the pair of gobstoppers at the end of this post. Silver spreads out and beads up on top of Iris Dense Blue. When the silver is reduced and encased, it forms a silvery blanket under the clear layer. In the leftmost bead, my little fritty bits of silver glass developed an organic light border, and the surface of the Iris Dense Blue reduced to a gunmetal-ish colour. In the rightmost bead, I got an interesting light border around all of my TerraNova2 frit and a starting strike to burgundy, but no unusually great striking results. Iris Dense Blue separates on top of Tuxedo, and if you compare the way it looks on top of Tuxedo to how it looks on top of all of the other colours here, I think you'll have to agree that it looks both brighter and bluer on top of that colour than with any of the others. Copper Green, Opal Yellow, and Peace all separate on top of Iris Dense Blue, and Iris Dense Blue separates on top of them as well, a faint dark line running through the centre of its dots and stringer lines. It fumes Peace a weird greenish colour, both when Peace is above and when it is below it. The big star of this series of tests is the behaviour with Ivory. On top of Ivory, Iris Dense Blue separates into light and dark, and throws a brown reaction line. The resulting effect is of a 3-dimensional set of stringer lines and dots that looks raised off of the Ivory base glass which is very appealing. 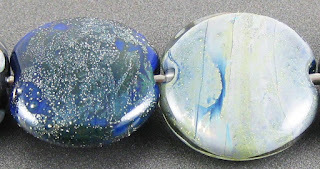 When Ivory is used on top of Iris Dense Blue, the result is still interesting. You still get the dark line and the light outline, but because the reaction 'shadow' encroaches on the Ivory and not the blue, the stringer dots and lines take on a messier, uneven appearance. Here are some beads that include Iris Dense Blue. Great information thanks a lot for the detailed article.That is very interesting I love reading and I am always searching for informative information like this.Excellent information on your blog, thank you for taking the time to share with us. Thanks, Jhon! :) I am glad you found it helpful.